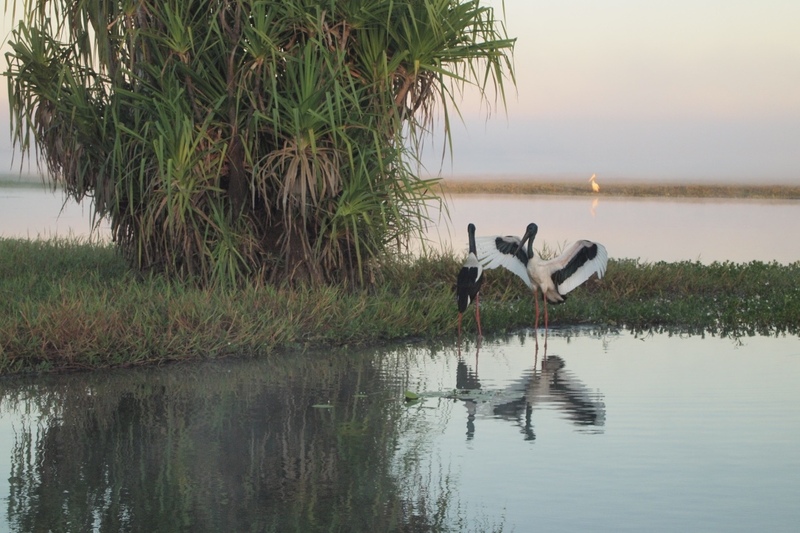 Kakadu NP is huge and so we moved camp to the Cooinda Lodge Caravan Park in the southern part of the park so that we were based closer to the Yellow Water Cruise for our 6.45am start. 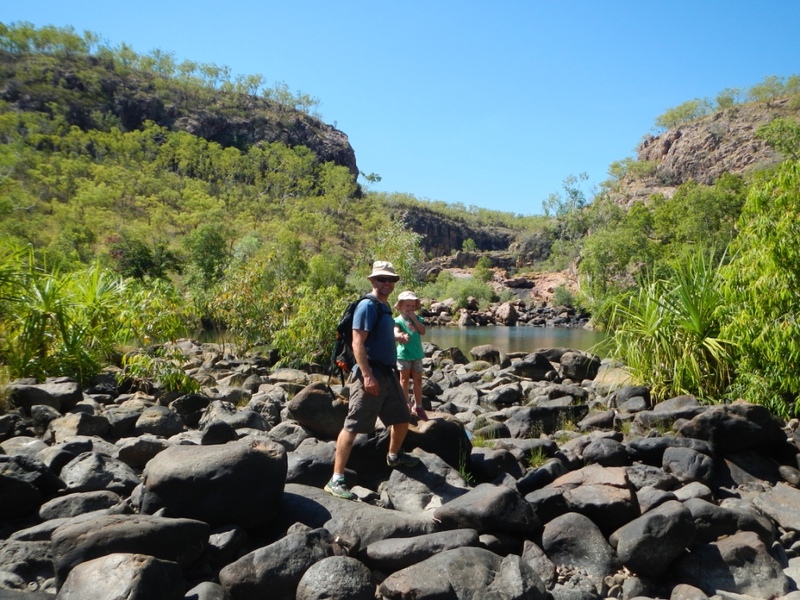 From here we visited the Nourlangie (Burunggui) site and walked the loop to see the views and more amazing rock art…the scenery in Kakadu is truly beautiful words can’t describe these sites…and I am not sure the photos do it justice either. 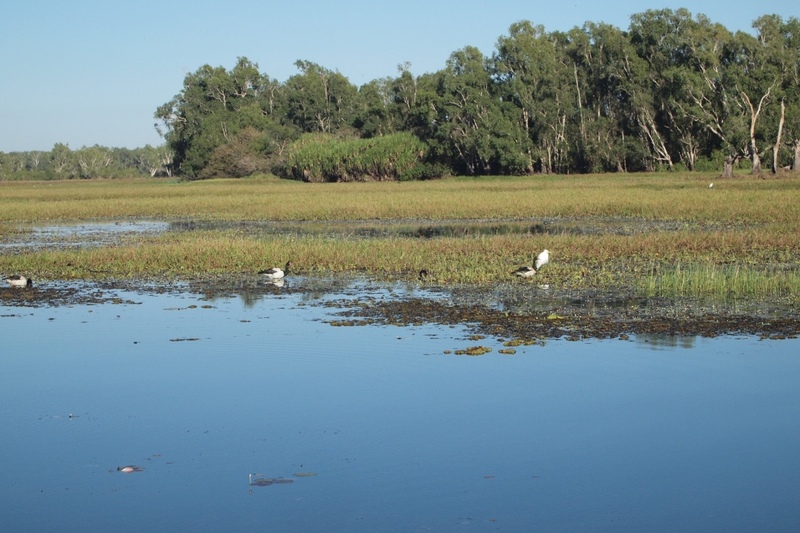 It was another really hot day but we all enjoyed a walk around the rock art and the Sandy Billabong, which had beautiful views and plenty of birds for Aaron and Holly to spot and identify. 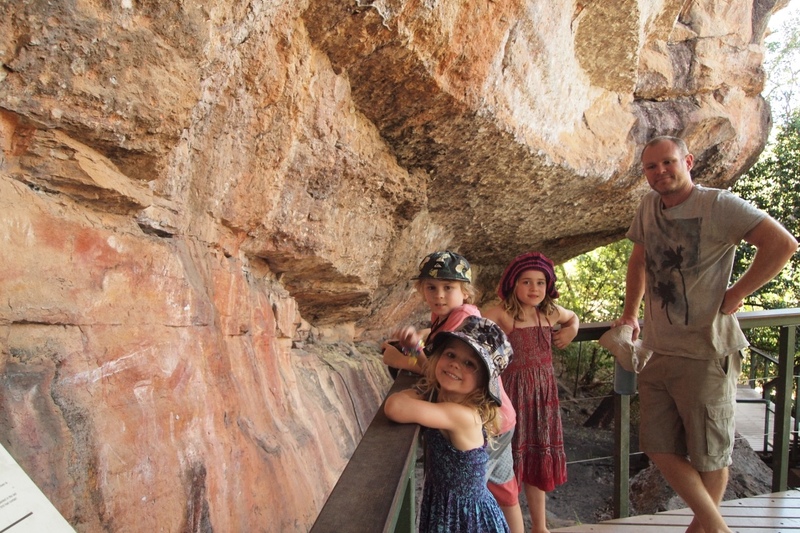 The top of this walk we enjoyed views out over to Arnhem Land and the sacred dreaming sites – this is one of the most sacred aboriginal sites in Australia. 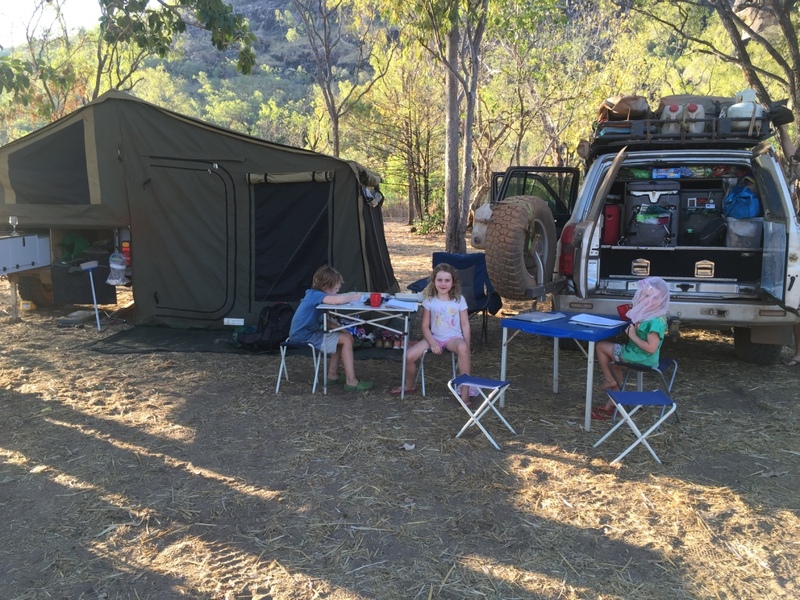 Thankfully we returned to our camp at Cooinda Lodge which had a very fresh (read freezing) swimming pool, which was great for the kids after a big day of sight seeing in the sweltering heat – they met some nice kids Aiden and Madison at the pool. After a swim it was an early night before our Yellow Water Cruise. 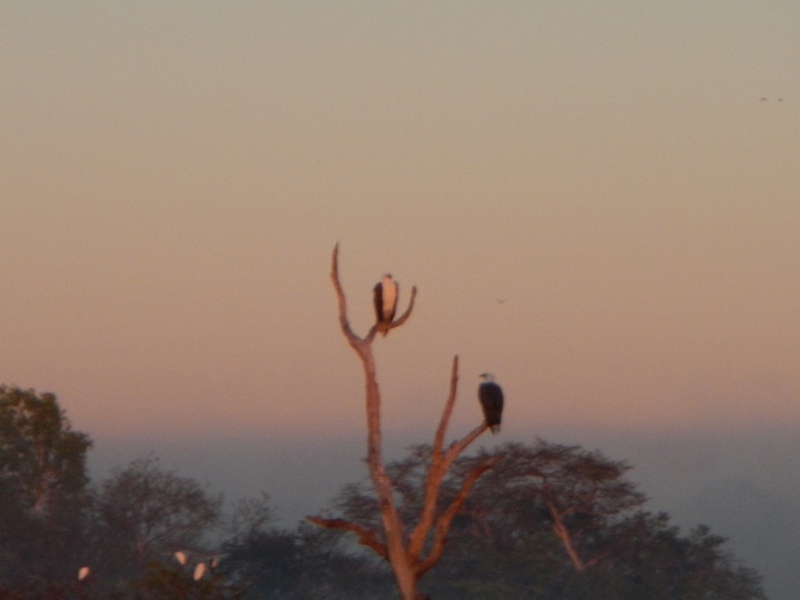 We were up early and had three excited kids waiting to board the cruise boat. 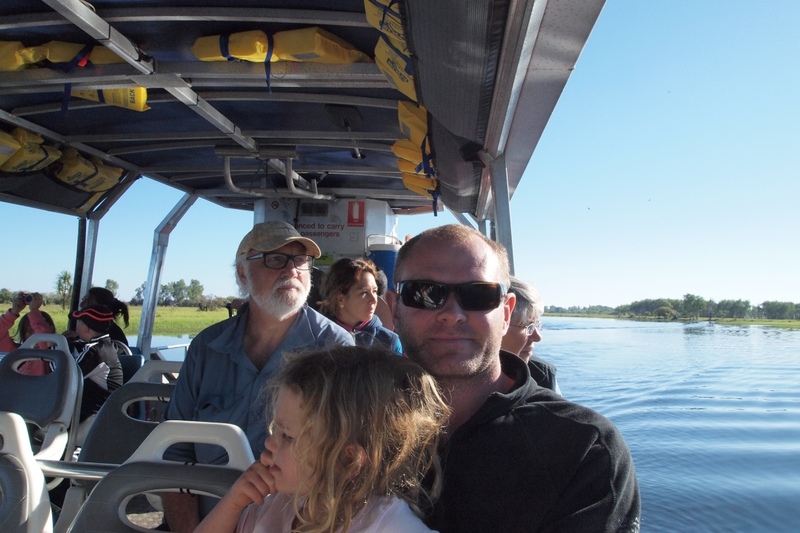 We chose the sunrise cruise, as this is when the water is yellow – sunset and sunrise – and the scenery is really spectacular. 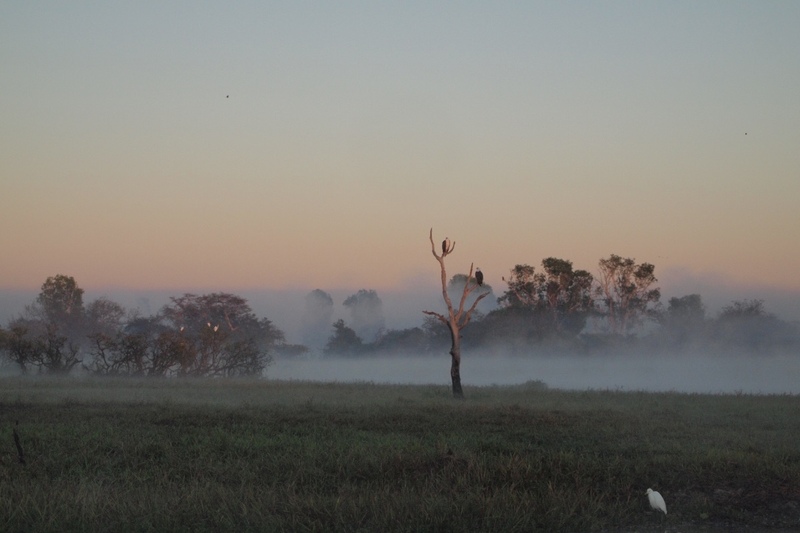 When we arrived at the boat there was an eerie mist over the water. 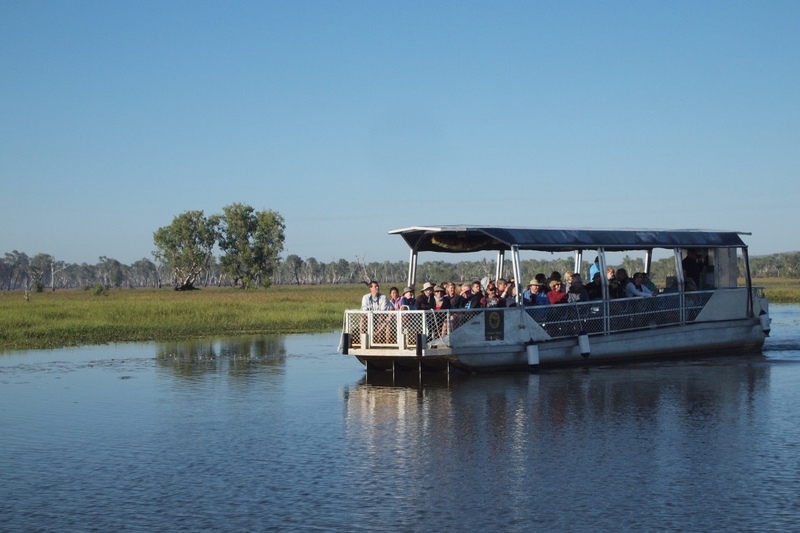 The tour was fantastic we all enjoyed the scenery, birds and crocodile spotting. 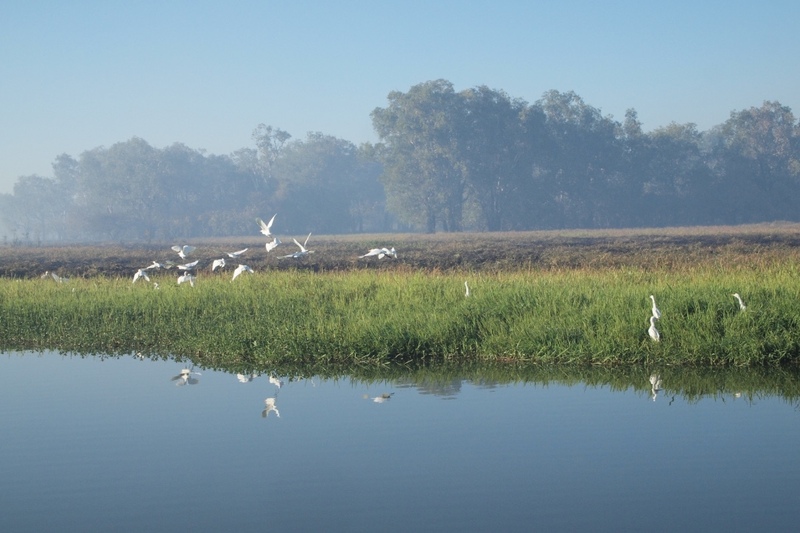 In stark contrast to the crocodiles we saw at Adelaide River these crocs did not approach the boat or even flinch at our presence…more calm and natural. 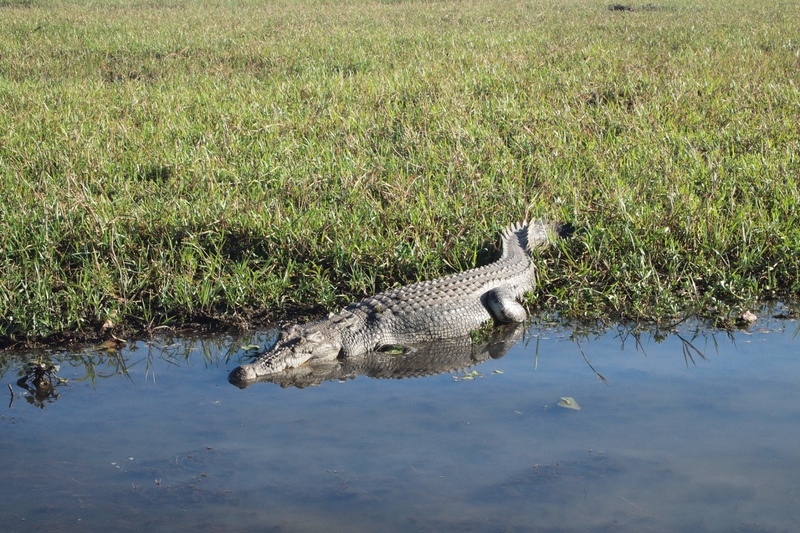 We did see one crocodile try and catch a large Egrit that was having trouble swallowing a fish but as the crocs got close he just stepped back out of the water in time to avoid the snap! 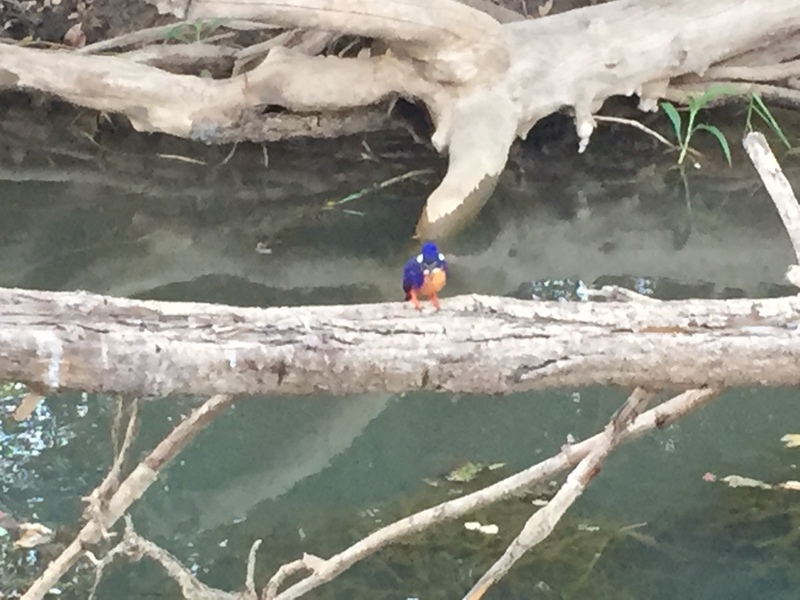 We could see he was a sneaky and skilled hunter moving very close before revealing himself. 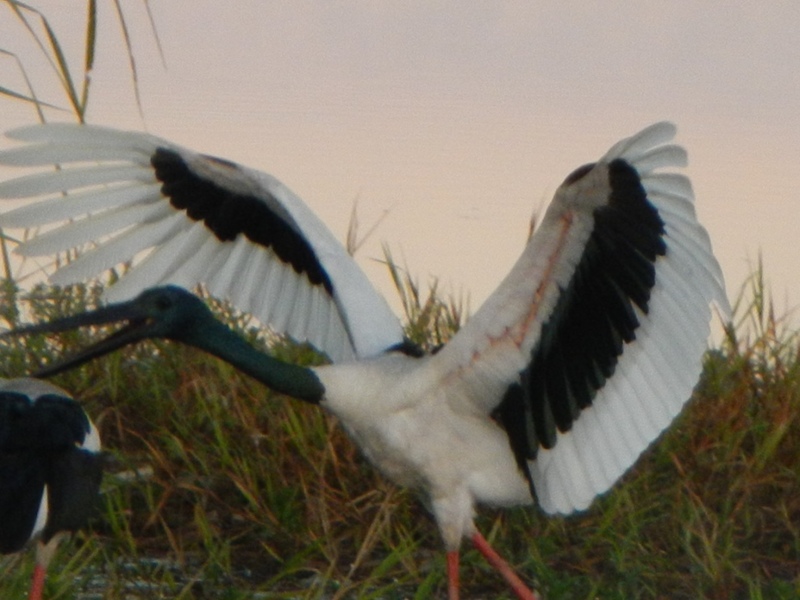 We were treated to seeing several Azure Kingfishers, Brolgas, Greater Egrets, Magpie Geese, Whistling Ducks, a couple of huge White Bellied Sea Eagles, Jacana (also called Jesus birds because they walk on water as they cruise over the lilly pads) and a couple of beautiful Jabiru or Black Necked Stalk (Australia’s only stalk) amongst many other birds. 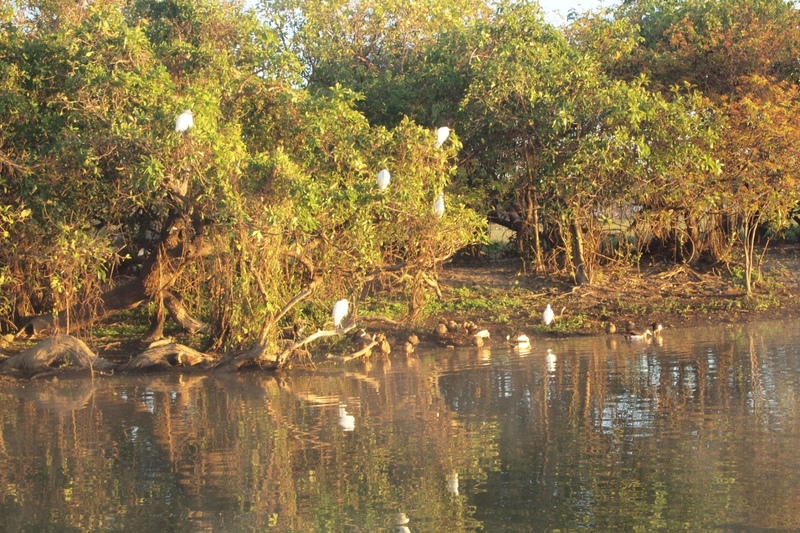 It was a morning to remember but two hours sitting still on a boat was a tall order and the kids teamed up with their new friends and were ready for breakfast feast back at the resort. 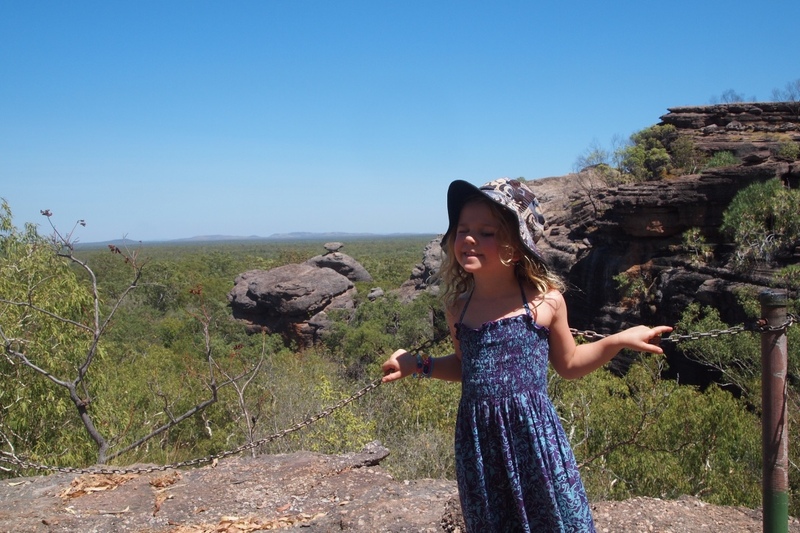 Our last stop in Kakadu was Koolpin Gorge (now called Jarrangbarnmi). 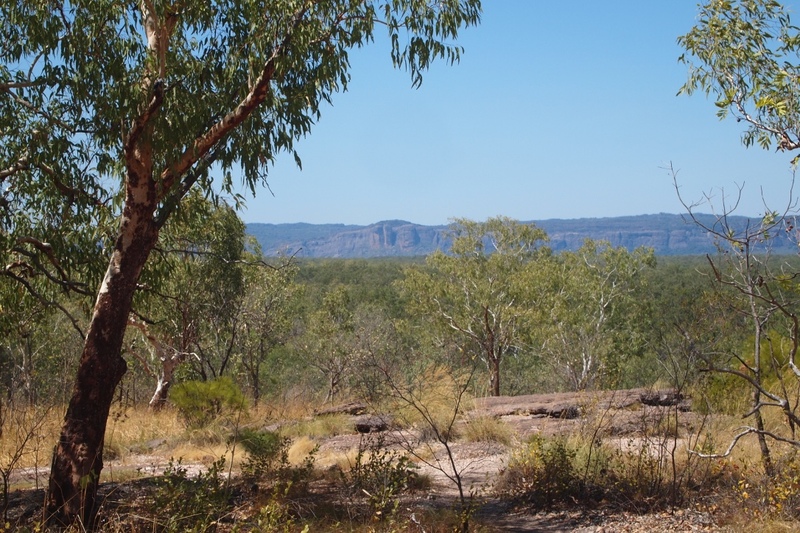 This gorge requires separate permits as there are limited camp sites. 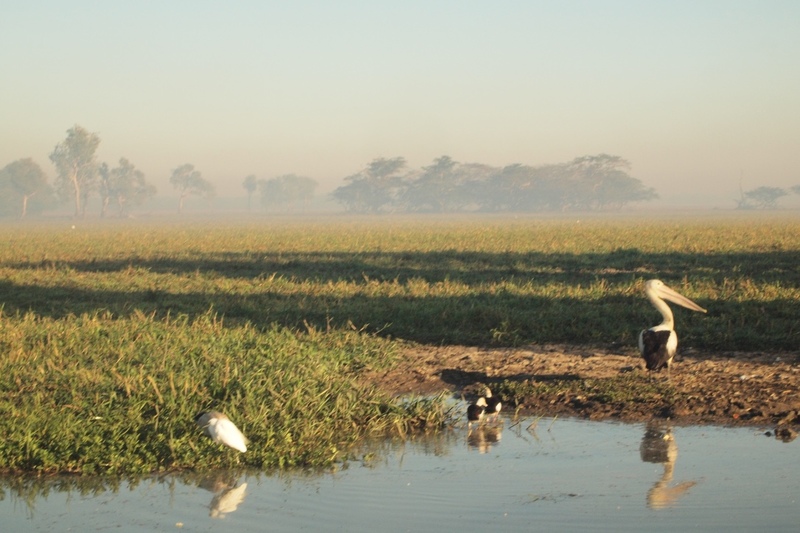 It is sort of remote accessible only by 4×4 and there is no mobile service. 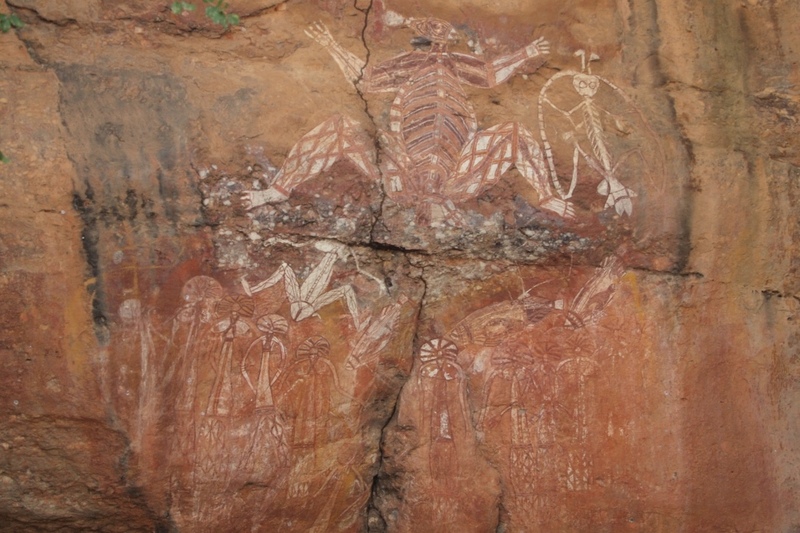 The area is also restricted to protect some rare the flora and fauna found only around this gorge. 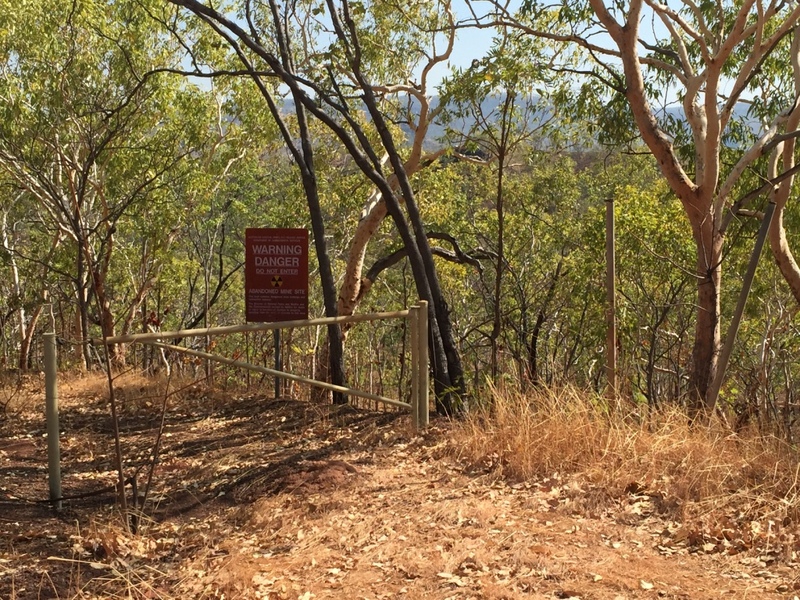 With our permit in hand we collected the gate key and set off. 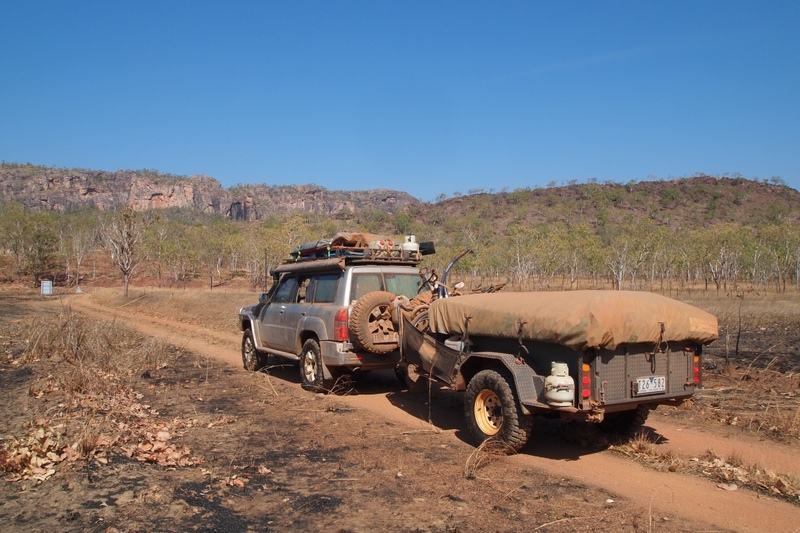 The drive into Koolpin was a fair 4×4 track – some tight winding corners but nothing to difficult on the way out we passed closed uranium and asbestos mines – this area has long been the ‘sickness country’ by the Aboriginals where spirits in the rock should not be disturbed! Not a coincidence. 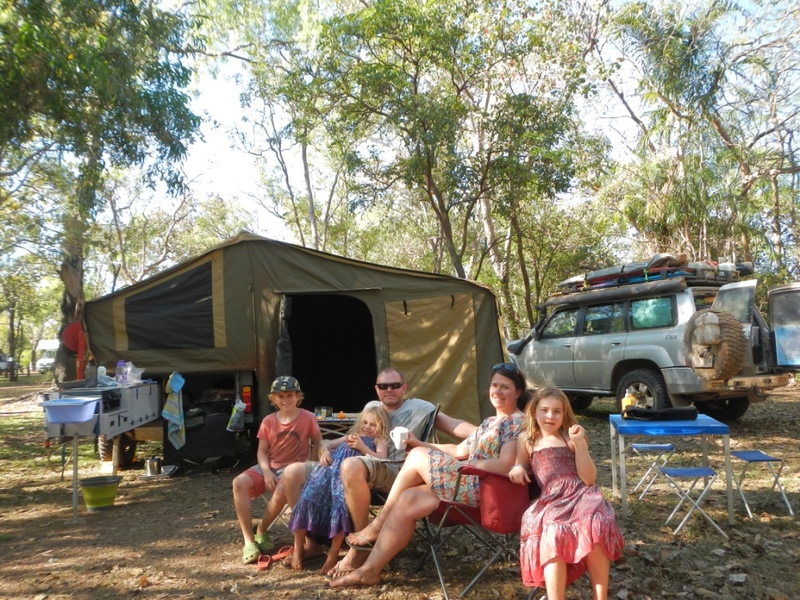 We were excited to arrive and be the only campers at the camp ground. 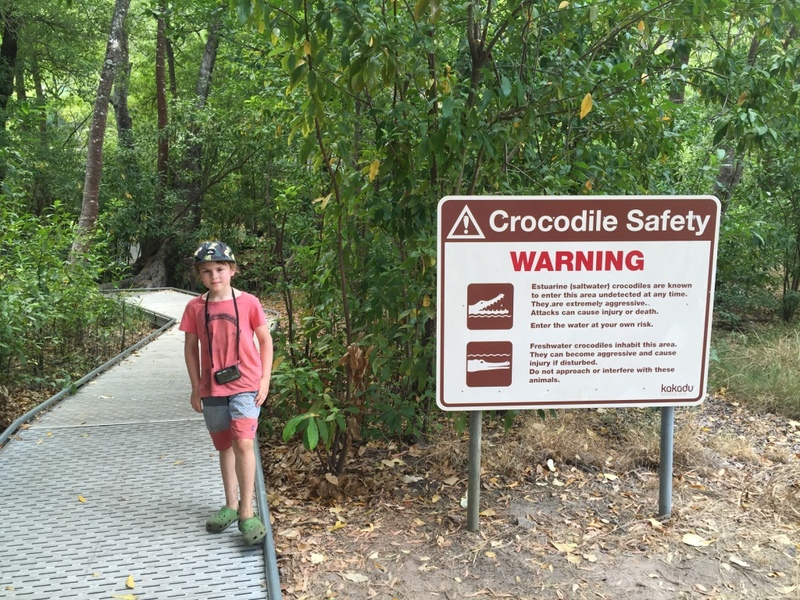 After camp set up we hiked to the gorge past the first lower pool which had these signs and a croc trap…the pool may contain crocs YIKES! 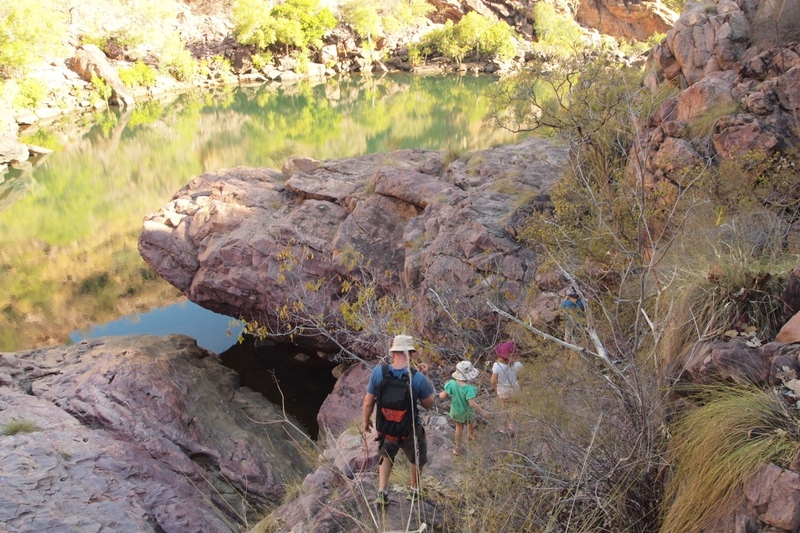 We walked to the upper pools (crocs done climb rocks) deemed safe for swimming. 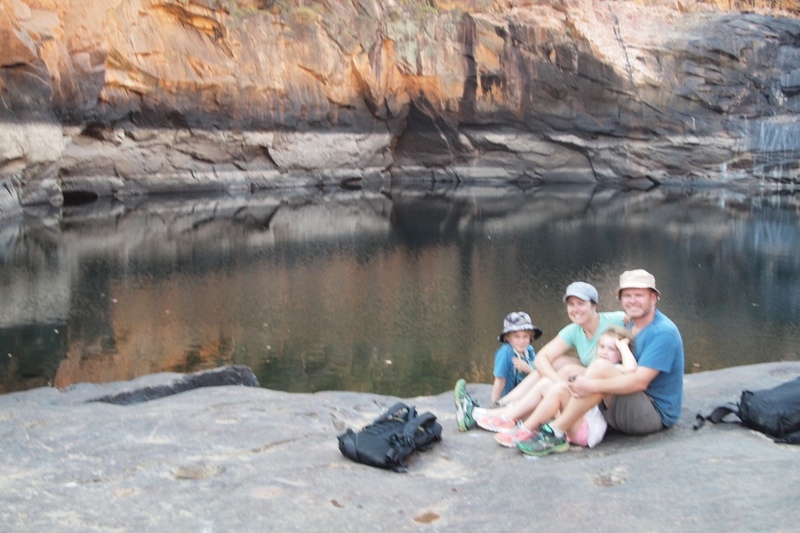 We had the whole gorge to ourselves…a rare treat in Kakadu! The waterfalls were not flowing and the high water marks indicate just how much water moves through here in the wet. 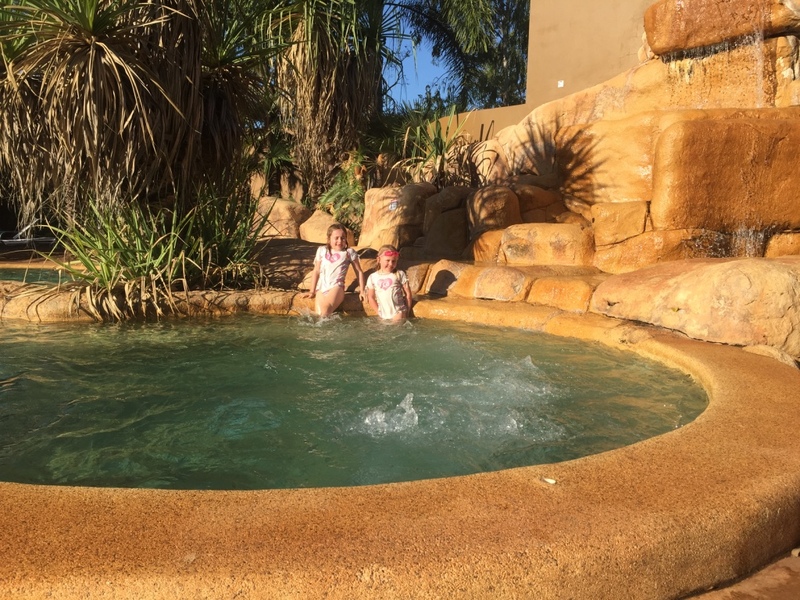 We all enjoyed a special swim and some peaceful time enjoying the amazing environment. 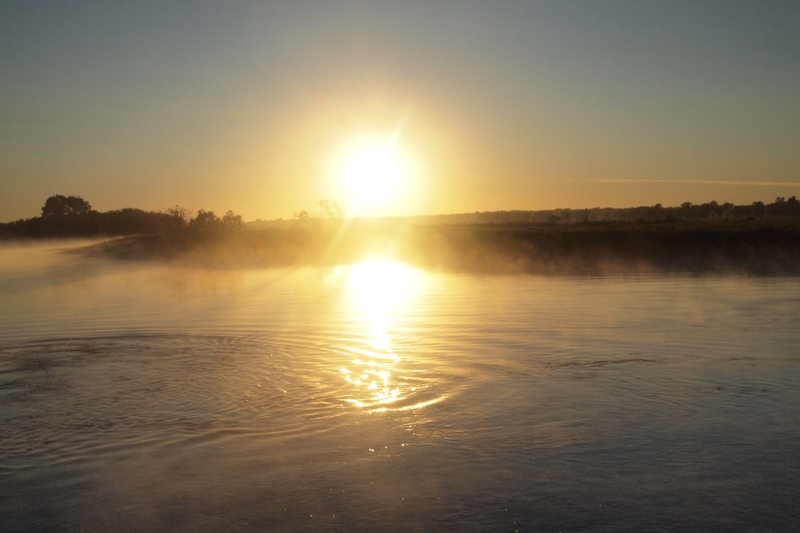 Another amazing day we are so lucky! 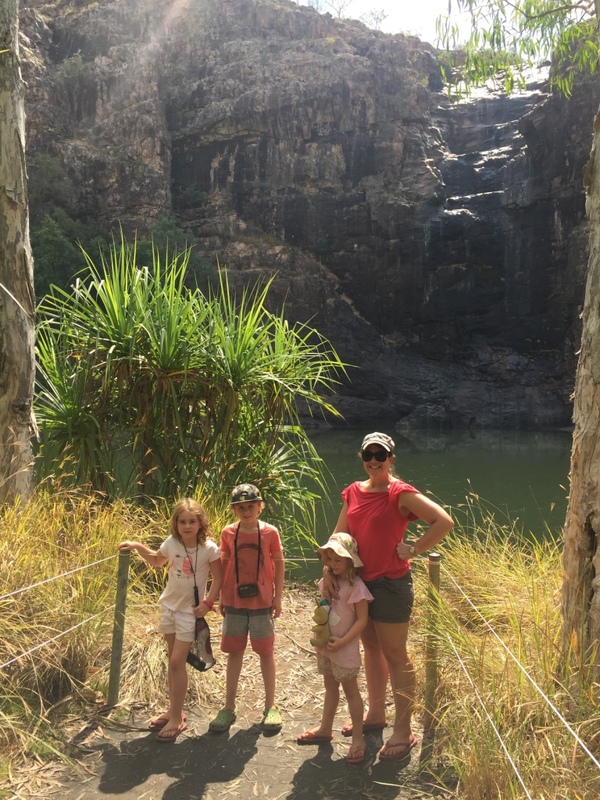 As we were leaving Kakadu we visited Gunlom Falls but unfortunately the top pool was closed due to smoke from burning off. 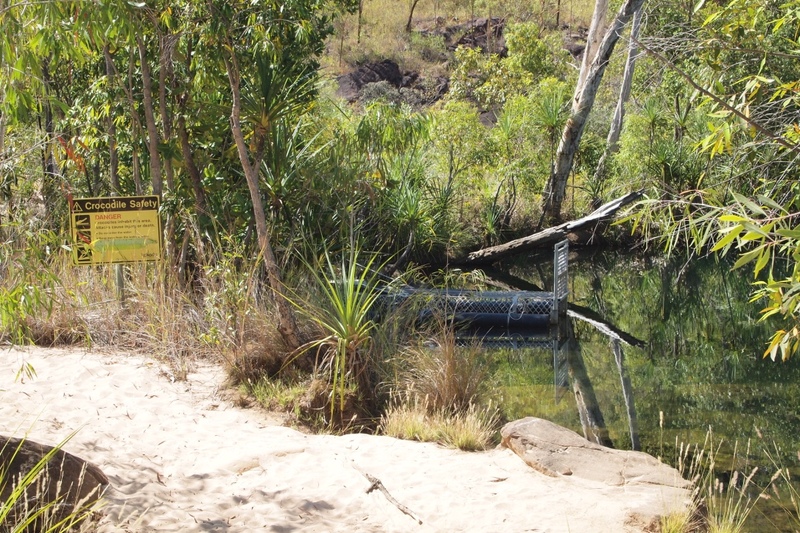 It was another hot day so could not resist a VERY quick dip in the lower pool…a quick dip as there was the croc risk sign! 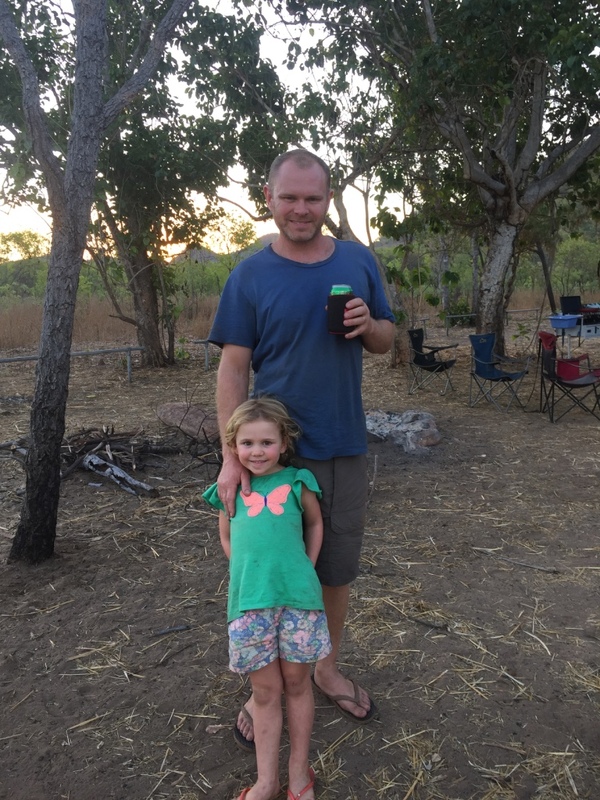 This was our last adventure in Kakadu we didn’t see it all, there is too much to see but we loved Kakadu it is a special place… we headed south back towards Katherine.